Yesterday I wrote about creating better PowerPoints for presentations . . . not just presenting information but providing stuff that your audience wants to know about and/or learn. I told you about Cliff Atkinson’s Beyond Bullet Points (BBP) method and encouraged you to at least explore his ideas. Just to reiterate . . . YOU see the above view and your viewers see the full screen PowerPoint slide. They don’t see the Presenter View. To set this up properly, you may need to go to the Display settings in the Control Panel of your computer (PC) and make sure that the primary display (your computer) shows the Presenter View and the secondary display (the screen your viewers see) is the secondary display. However, don’t spend a lot of time trying to figure this out, either. Have a tech person meet you in the room where you are presenting to help you set it up. Then, when you need to do it the next time, you’ll know what to do. I find that this is easier to set up in the new PowerPoint 2007 or in the Mac PowerPoint 2008, but know that this view is also offered in PowerPoint 2003. 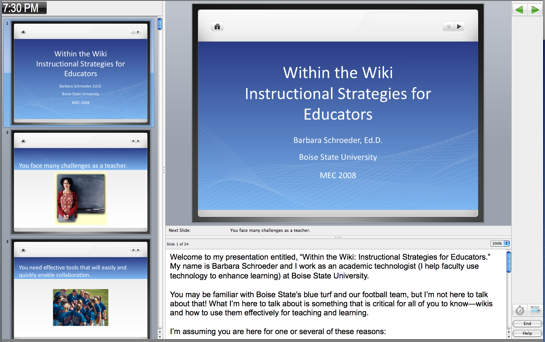 Also, if you are an Apple user, you probably prefer using Keynote, which also has a Presenter View. Try this out the next time you are presenting. Your audience will be impressed at how effortlessly your narration seems to flow! Just smile and say thanks. Aha! I knew there had to be something like this in PowerPoint! Helpful tip indeed. Thanks!